Since Obamacare became law in 2010, big retail chains have been prominent among the private employers shunting workers off their insurance rolls and onto public health care exchanges. Home Depot (HD) and Trader Joe’s each announced such plans in recent months for part-timers. Costco Wholesale (COST), though, went the other direction, creating a partnership last year with Aetna (AET) to offer personal-insurance plans designed to be cheaper than at the state exchanges. While most retail executives are vocal in their opposition to a higher minimum wage, Costco CEO Craig Jelinek came out in favor of lifting it – a stance that echoes the warehouse-club’s longtime policy of paying its employees a starting wage well above the legal minimum. One of the few complaints Wall Street has ever lodged against Costco – among the best-performing consumer companies of recent decades – is that it gives its employees and customers too good a deal. While sales growth has been stellar throughout the Issaquah, Wash.-based chain’s 30-year history, investors carp that its profits could be higher if it raised prices or squeezed employee pay a bit more. But Costco, led in practice and spirit by co-founder and board member Jim Sinegal, holds firm to a philosophy that happy, loyal employees and customers who have faith that they are getting a great deal are a recipe for long-term success. Consider, for a moment, rotisserie chickens. In the fiscal year ended Sept. 1, the company sold 69 million of the plump, cooked birds, for $5 apiece – a price it has refused to raise over the past year and a half, despite surging costs for the fresh chickens it buys. Quizzed about its value pricing on a recent conference call with analysts after reporting financial results, Costco Chief Financial Officer Richard Galanti said simply: “That’s what we do.” The company avidly cultivates what it refers to as “absolute pricing authority.” This is the belief among its customers – who pay an annual membership fee to shop there – that Costco’s prices are reliably as low as are likely to be found anywhere, across every product. The company has had a longtime policy of limiting its markup on all products to 15%. It keeps a fairly limited array of products in stock compared to such competitors as Wal-Mart Stores (WMT) and Target (TGT), often carrying a single brand of a popular product, which gives Costco plenty of sway over suppliers to cut favorable deals on its goods. As a result, Costco is beloved by customers to a degree rarely seen by big-box retailers. A Harris Interactive ranking of companies by brand reputation found Costco was the 10th most highly regarded company in America, and the top-ranked broad-line retailer. Worldwide, more than 86% of its customers renewed their membership last year. Among its key small-business members, the renewal rate was 94%. Costco has deftly struck a balance between a reputation for cut-rate prices on bulk necessities and the serendipity of encountering great values on luxury indulgences. The company boasts of the “treasure hunt” element of prowling a cavernous Costco warehouse, with a frequently rotating selection of discretionary items mixed in among the Tide and the tuna. Coscto sold $1.4 billion in wine last year, more than half of that being what it classifies as “fine wine.” The “What’s New” assortment on the home page at www.costco.com recently featured a $1,299 high-definition home-security system, a $749 Fendi handbag and a $59.99 Swarovski crustal Christmas-tree ornament. 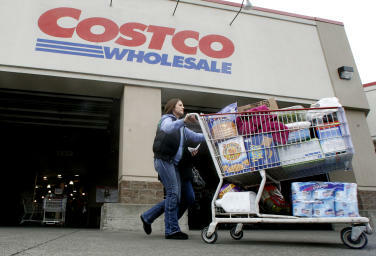 Wall Street has fondly embraced the Costco way and cheered its growth strategy. The stock is up more than 1,000% since the company went public in 1986, compared to about 600% for the broad stock market over that period, some proof that companies can do well for shareholders while doing good for customers and employees. Over the past five years, Costco has appreciated 130% to its recent stock price near $117, well ahead of Wal-Mart and Target. Its dividend per share, now at $1.24, has increased at an average annual rate of 12.7% since May 2004. It’s a touch ironic that Costco, master of cheap prices for quality goods, has almost always had a stock that trades at hefty premium to its competitors’ shares, relative to their reported profits. The stock is now valued above 23 times anticipated earnings for the fiscal year ending next August, compared with 12 to 13 times for Target and Wal-Mart. Value-minded investors might wish for the stock to pull back a bit to give them a cheaper entry, but the stock has stayed chronically expensive – which has not prevented it from rewarding shareholders nicely over time. This generous valuation bestowed on Costco, which now has a stock-market value of $51 billion, reflects investors’ confidence that the company can continue its methodical expansion, especially overseas, all the while gaining bargaining power with suppliers and growing membership briskly. The company has 634 locations, with 454 of them in the U.S. and the rest spread across Canada, the United Kingdom, Mexico, Japan, Taiwan, South Korea and Australia. Notably, Costco is focused for now on relatively mature economies with somewhat more well-heeled citizens. It is big enough to be a powerful presence in retail, but not so big that it has nearly saturated its potential geographic opportunities. The company is on track to open 36 new warehouses through next summer, half of them outside the States. Analyst Michael Exstein at Credit Suisse points out that Costco is a leader in sourcing its merchandise globally as a single entity (regardless of geography or online/offline channels). The company remains “singularly market share focused” in its global expansion, at a time when Wal-Mart, for one, has been scaling back its growth plans globally. “With a clear strategy that has been validated over 30 years and has become increasingly accepted internationally,” says Exstein, “we believe that Coscto’s growth profile will be one of the highest” in the general-merchandise retail industry.